Butterflies fill my stomach as I approach the start line. I spot a trash can out of the corner of my eye and for a moment, contemplate heading in that direction. “It will be okay,” I tell myself. I still feel like I could get sick. I swallow hard. I set my feet and lean forward. Deep breath. I lunge forward off the line and begin jockeying for position and place. These are my recollections as a high school athlete who did not know Jesus Christ. I dealt with the stress of competition by positive “self-talk” and replaying well-intended comments from coaches. Yet, this offered little comfort and courage in my circumstance. Now that I am a Christian, I have often wondered how differently my athletic experience could have been had I been pointed to Christ and His power available to me. Thankfully, at Cary Christian School, my children are inheriting the coaching I wish I had received. As a spectator, I cherish witnessing the team prayer before a game, match, or meet. Joy abides as I behold coaches impart life lessons through the platform of athletics. I am immensely thankful for the cultivation that is taking place in our athletes. CCS coaches are more than well-intended individuals; they are life-givers. They speak words of encouragement and truth that impart strength, peace, courage, and vision for life. Catch a glimpse at how our coaches are forging character and leadership on the field of play. 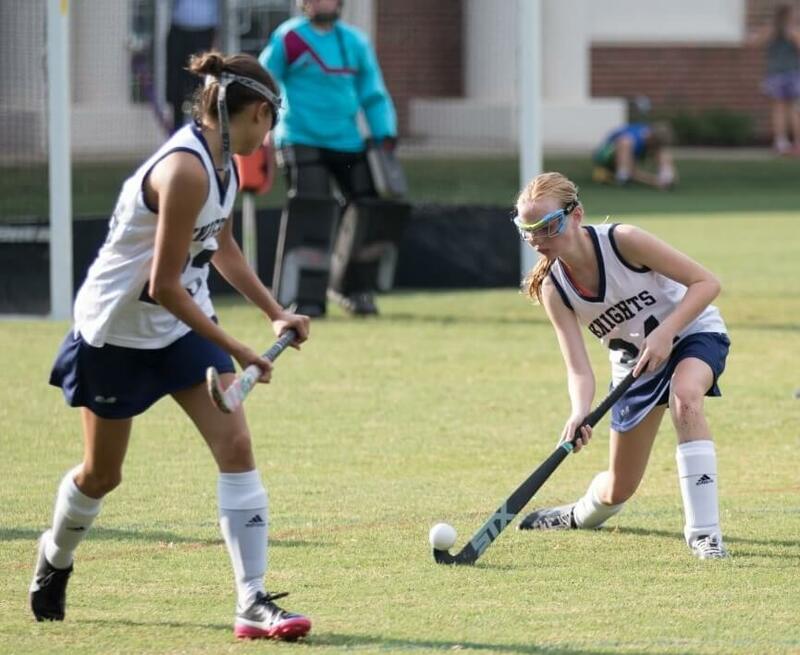 For me, it’s important that my middle school field hockey players learn to love and accept each other just as they are, affording the grace that has been afforded us through Jesus. Teaching the skills of the game and exercising the body are secondary to conditioning one’s mind and heart for Christ. What I’ve found is that by developing positive and encouraging relationships with one another, my girls are able to become more confident in their identity in Christ. Knowing that they are loved and that they do not walk alone is sometimes the most important achievement of the season for girls who are becoming teenagers. Soccer, like most sports, provides many opportunities to develop good moral character in CCS students. Individually, players learn to demonstrate responsibility, fairness, respect, and integrity. As a team, we build a strong squad through hard work, discipline, and teamwork. Before each game we huddle and pray that the Lord allows us to play to the best of our abilities, that He rewards our hard work, that we respect the outcome, and that we glorify God through our game. Learning to balance one’s passion and witness can be a very tight line, but as a team we realize that success is measured in many ways: whether it be a win, a good testimony, a hard fought battle, or awesome memories and friendships that will last forever. I am probably biased, but I believe Cross Country is one of the best team sports there is. To succeed as a team, runners learn in a practical way, that they must die to their own wants and desires for the benefit of the team as a whole. At our meets this season, we have seen this team mindset demonstrated as CCS students have run through great pain and physical exhaustion to do their part to help the team accomplish its goals. Many of the runners often cross the finish line and immediately go back out on the course to cheer on and encourage their fellow teammates. We hope that this experience will give them a tangible picture of what it looks like to serve with other members of the body of Christ for the purpose of glorifying God and introducing all peoples to Jesus Christ. As you can see, it’s more than just a game! We are cultivating leaders for life through CCS Athletics.